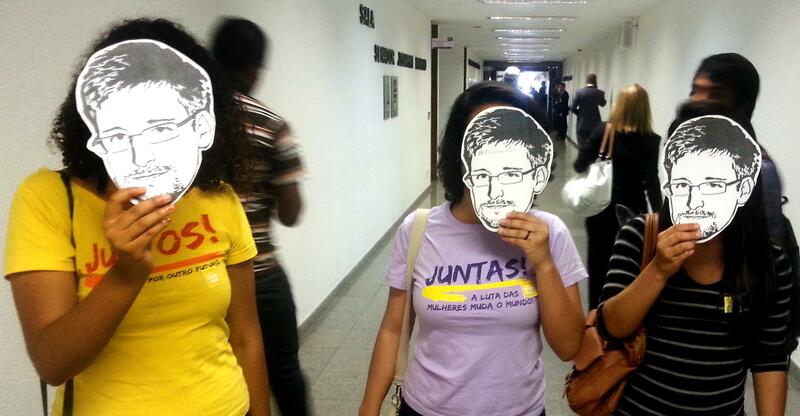 Opening Act: The Only Rule Marked "Top Secret"
Activists pose with masks of Edward Snowden during a public hearing of Guardian reporter Glenn Greenwald in Brasilia, Brazil on August 6, 2013. As usual, Charlie Savage is the only reporter who studied a leaked document long enough to learn its meaning. The latest find hints at more surveillance of communication between Americans and foreigners. Hints of the surveillance appeared in a set of rules, leaked by Mr. Snowden, for how the N.S.A. may carry out the 2008 FISA law. One paragraph mentions that the agency “seeks to acquire communications about the target that are not to or from the target.” The pages were posted online by the newspaper The Guardian on June 20, but the telltale paragraph, the only rule marked “Top Secret” amid 18 pages of restrictions, went largely overlooked amid other disclosures. To conduct the surveillance, the N.S.A. is temporarily copying and then sifting through the contents of what is apparently most e-mails and other text-based communications that cross the border. And in non-leaked news: The DEA tells agents to cover up the existence of its investigations. Enjoy Pro Publica’s timeline, with video, of national security hedging. Ken Buck, who managed to lose a Senate race in Colordo in 2010, is running for the much-less-competitive seat up in 2014. Chuck Todd worries that the Hillary Clinton docudrama will be a “nightmare” for NBC’s non-entertainment division. Mickey Kaus jumps aboard the “Ted Cruz’s strategy always backfires” train – I’ve been riding in the cafe car for a while – though he sees further than I did. Jason Cherkis reports that Obamacare in Kentucky might not live up to Mitch McConnell’s predictions of horrible failure. And Eli Lake and Josh Rogin report that al Qaeda have been reduced to making conference calls.